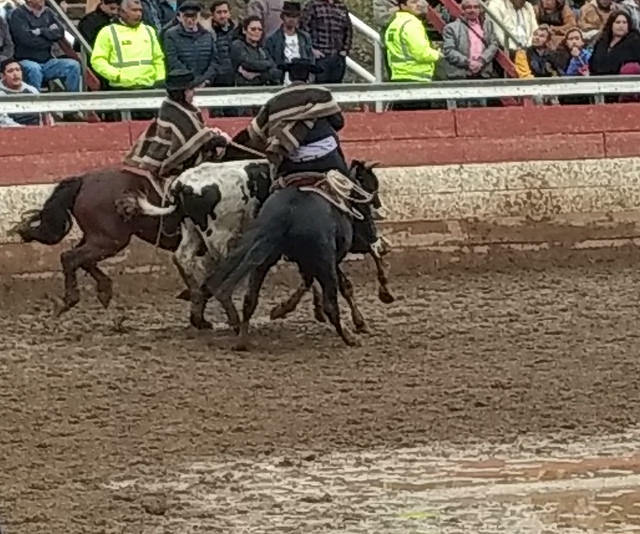 Chilean rodeo. Looks about as fun for the cow as U.S. rodeo. As I’ve often said, travel—with all of its new discoveries and exciting adventures—is also a challenge. While we were in Valparaiso about to go on a day trip to explore Casablanca Valley wines, I discovered that I left my ATM card in San Esteban at the last ATM we used. I was distracted while using that ATM and in a mad rush, which is no state in which to use an ATM if you want to keep your card. This would be the first time I’ve made such a mistake in all of my years of travel. As it happens, the bank will not send a new ATM card to Chile (because duh); however, it’s not the end of the world. I have lots of options available to me, but the easiest one was that I have a travel companion with an ATM card who made sure I have enough cash to finish my trip. A travel companion is a luxury that I don’t always have, so I’m grateful I had one (even if temporarily) to make this little hiccup easier. Then there was Dieciocho. Oh yes, a ton of fun in the days leading up to it, but what we didn’t expect was that it included three days of actual government holiday in which nearly everything shut down, with the notable exception of barbecues and fondas. This put the kibosh on grocery shopping (thank god for Chinese restaurants and Starbucks, which were still open), some sightseeing, and bike rental, which was something we’d hoped to do on those days. At this point, we had traveled to Santiago for the final days of David’s stay. So, we busied ourselves by seeing sights that didn’t require something to open, such as parks and outdoor areas. 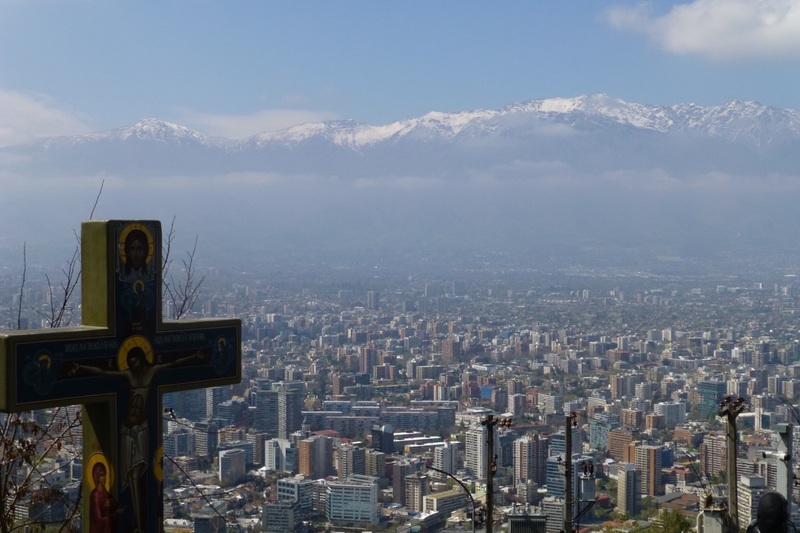 On the last day of the 3-day shutdown, Fernanda and Francisco (the pair we met in Portillo) came to our rescue and took us to a fonda in Las Condes, which was a much larger affair than the one we experienced in Valparaiso. This fonda was more like a county fair, with animals, Cueca dancing, copious amounts of barbecue and terremotos (that wine punch that is so ubiquitous around here), and Chilean rodeo, which was an interesting experience. Rather than attempting to rope a poor animal, the goal appears to be to corner it against a wall. To do so, the horses have been trained to gallop sideways, which must have taken an immense amount of effort from both the trainer and the horse. Anyhow, we had a great day with Francisco and Fernanda (and Javiera, Fernanda’s sister) and finished it off with a private barbecue at Fernanda’s. It’s been wonderful to have met new friends so quickly. The ATM card and 3-day holiday were but minor hiccups…but it’s amazing how even minor things can become magnified when you’re traveling and the time is ticking on someone’s departure, putting pressure on one’s desire to make the most of the last days. Speaking of which, David has now returned to the U.S. and I have officially embarked on the work portion of my stay. Thus, the less interesting part of my trip begins, which will naturally be full of work—but also my attempts to forge a new routine, one that includes hunting down the city’s best coffee (oh curse the long-reaching fingers of the Nescafe scourge! ), getting a handle on my allergies (it’s spring here, with new and wonderful pollen to get used to), and discovering a new running/hiking routine so I can stay in shape before my trek. 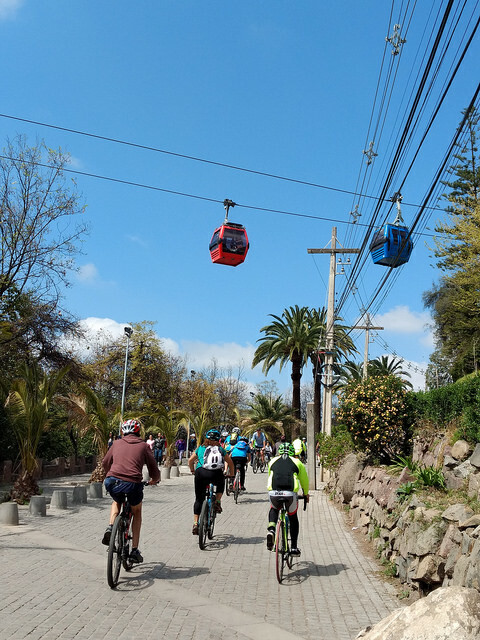 To this end, this past Sunday I visited Cerro San Cristobal, which is the peak of the second highest point in Santiago and a part Parque Metropolitano, the largest urban park in Chile. At the top is a church and a large statue of the Virgin Mary, standing watch over the city below. One can take a funicular to the summit, but I opted to hike on a steep trail (complete with switchbacks, of course), which proved to be of a challenging-enough pitch that I’ve decided to make this a regular activity to help me prepare for my trek. Now the work begins. At least this time I don’t have to deal with the trials and tribulations of high-altitude cooking.